Anticipation … The finale of The Twilight Saga, Breaking Dawn – Part 2, had the fans lining up around the block and circling the globe with a domestic estimate of $141.5 million. As with last weekend’s Bond launch the competition steered clear of the onslaught … kinda. Lincoln expanded nationally, taking on bloodsuckers (déjà vu?) and carving out a sizeable $20.6 that ranked third in the lineup. In the niches, the Hindi Diwali festival saw the launch of two major releases expected to be closely competitive but Jab Tak Hai Jaan emerged the favorite over Son of Sadaar both in India and the U.S. The former had an opening weekend of $1.2 million to the latter’s $318,000 in North America. The Tamil Thuppakki also proved strong with a $242,000 tally at 43 locations. In exclusive and limited release a couple of award contenders were off to solid starts. 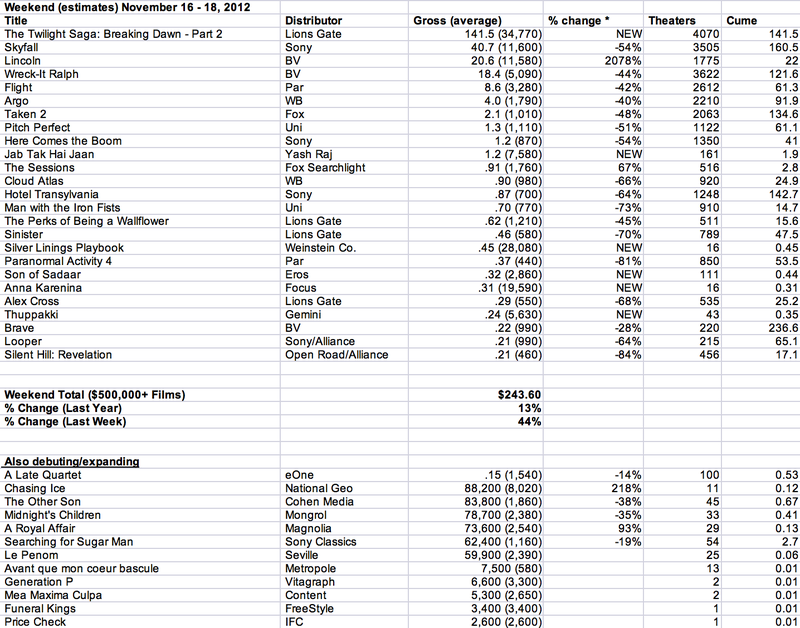 Silver Linings Playbook notched up $449,000 at 16 sites and the new Anna Karenina grossed $313,000, also at 16 locations. Overall weekend revenues shot up to roughly $250 million and a significant 43% box office boost. It was also 13% improved from 2011 when Breaking Dawn – Part 1 bowed to $138.1 million and Happy Feet 2 was a distant second with $21.2 million. Tracking was torrential for the closing chapter of The Twilight Saga and the picture indeed debuted at the top end of prognostications. About the only surprise in the mix was that the film played ever so slightly older and less feminine than past excursions. Company tracking revealed an opening weekend 50/50 split for the plus/minus 25 year-olds and an audience that was “only” 79% women. Breaking Dawn – Part 2 also opened day-and-date in most of the rest of the world (except major Asian markets) with initial estimates just shy of $200 million. It’s definitely a franchise that will be difficult to replicate … until the next sensation reveals itself.